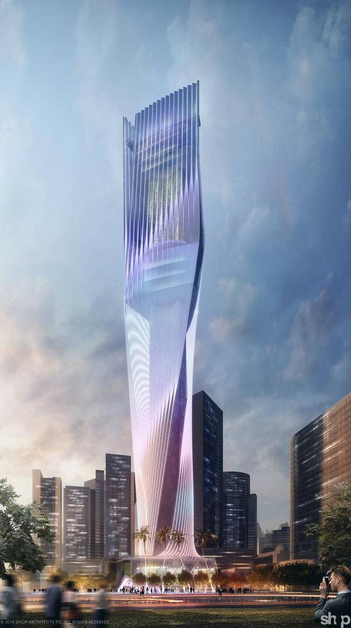 Even in a city like Miami, this twisting, LED-emblazoned tower seems a bit over the top. The curious 633-foot structure, called the Miami Innovation Tower, is the work of SHoP Architects, a firm known for adventurous designs, from the Barclays Center in Brooklyn to skinny supertall skyscrapers in Manhattan. But even with that reputation, this one takes us by surprise. 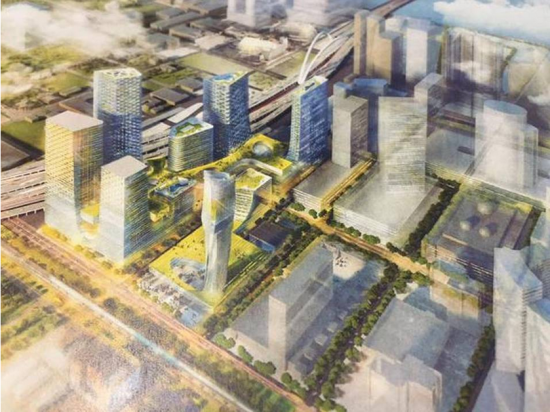 The Miami Herald reported that the tower is part of developer Michael Simkins’ plan for a four-block scheme to be called the “Miami Innovation District.” The massive complex would sit between Miami’s booming downtown and Overtown, which the Herald noted is one of the poorest parts of the city. Last week, SHoP reportedly submitted plans to the city for the Innovation District. But let’s circle back to that twisting tower for a second. The basics: it has three sides, each of which can sport a digital sign up to 30,000 square feet. These massive walls will be put to good use, flashing 24 hours a day, seven days a week. There are also two more billboards on the tower’s podium. So, to recap, in total, the Miami Innovation Tower is poised to include two acres of advertisements. Along with this advertising acreage, the tower will also have lounges, restaurants, gardens, plazas, and observation decks. In a statement to the Herald, Simkins said: “The iconic tower will elevate the city’s brand on a global level, enhance the city skyline, and complement and enhance the surrounding community.” That could be true, if by “enhance the surrounding community” you mean flash glowing ads around the clock. The tower definitely has some hurdles to pass before its billboards are switched on, but Simkins’ vision might actually happen. “Miami’s zoning administrator gave [Simkin’s] Miami Innovation Tower plans a nod in March 2014, and in December the developer signed a covenant with the executive director of the redevelopment agency, which has to sign off on his sign application because it lies within the agency’s boundaries,” reported the Herald. While the project will surely be controversial (the non-profit Scenic Miami has already said it is “appalled, truly appalled” by the plans), large-scale digital ads are not new to Miami. Just ask the dancing LED woman on the side of the Intercontinental Hotel (below).